And let’s not forget of course the fundamental, underlying, omnipresent reason that I thought the running side of triathlon training would turn out to be alright, which is that I am actually a complete moron. It’s hard – every second that you do it. To do a good run, you have to push yourself to your limits, tying not to puke or cry, for as long as it takes to get to your required distance in the time that you want. There’s no escape; it’s just you in your own head and there is nothing preventing you from stopping except your own will. The same ‘will’ that is being zapped by the pain and discomfort you are putting yourself through. It takes incredible mental fortitude to run. And it turns out that I am a total baby. I had my last physio appointment with Jake last Friday. He announced I am fixed, and if I remember to continue with my prescribed exercises I shouldn’t have any recurrence of the pain. Thank you Jake, may we never meet again. Then I put together my training plan for my next triathlon – a 12 week schedule detailing how far to run, cycle and swim… and when to do each of them. Sorted. Basically, it seemed clear to me that with my map to success laid down on paper and having the all-clear from Jake, it was time for my running career to turn the corner towards outstanding brilliance. I was ready. I didn’t rush into it – on Monday I did a 4km run to get my bones ready. And yesterday I spent all day dreaming about running. I felt it inside of me brewing, and I knew it was time to do my longest run so far. Nothing over the top, but anything over 6km was definitely on the cards. Great times! I thought. I was actually excited. Finally, it was time to go to the gym. Time to run. I arrived feeling energised, having just scoffed a pack of my sesame snaps. I had my favourite gear on – always a winner. Nothing could go wrong. I set off, stepping easily into my practiced good form. Steps 6, 7 and 8 were AMAZING. I thought of all the people in the car park behind me (which I was exiting) and did a fantastic rendition of my very best ‘I am going for a run’ face which is very serious and pouty. I topped it off with a flick of the hair that hopefully said ‘a long run, thank you’. Then as I took steps 9, 10 and 11, it hit me with brute force – er, wait… This isn’t nice AT ALL. For the entire first kilometre my body raged against me. It was still too hot outside and not one single bone or muscle that I owned felt like a runner’s bone or muscle. They felt like the bones and muscles of someone who should be having a beer in front of the tv, safe at home. Maybe 4 beers and chocolate cake. I spent the second kilometre talking myself into it, forcing myself to admit that I was indeed running and I hadn’t actually died, therefore I was technically a runner. The third kilometre finally approached, and I realised that running is easy! No problem, I love this! I am at one with the birds and the trees, just me and my thoughts! At about the 3.1 kilometre mark I thought the world was ending. I overtook two walkers in the fourth kilometre, forcing my ego to puff out my chest and pick up the pace to an unreasonable effort that I knew wasn’t sustainable for me over a 5km distance, let alone something longer. But when my ego takes over, my brain takes the opportunity to have a nap and I had no choice but to continue to run my socks off until I was out of sight of the walking people. So then for the 5th kilometre I had to try not to die of cardiac arrest caused by overexertion. I also got a stitch and had to focus all my effort on breathing. During the sixth kilometre, I lost my hearing and the only sound to entertain me was that of my blood pumping like a raging river through my veins as I bounced up and down. I wondered vaguely if my head would explode. Finally, as I hit the 7 kilometre mark and saw my car 200m in front of me, I realised I need finish lines to keep me going. Finish lines, that’s what I’m aiming for. I need to practice being mentally strong enough to push myself through running when I don’t want to. And I don’t mean ‘oh I don’t fancy it tonight’ I mean the kind of not wanting to when every brain cell I have is telling me a hundred very logical and sensible reasons why I genuinely should not run any further. Because I am struggling now, and I am only running 7.2km. I have to be able to run 10km, after completing a 1.5km swim and a 40km ride. I have to practice not being a baby. So I got home and started googling running races. With 11 weeks until Straddie, my calendar looked a little full to squeeze in a race. But with the time between Straddie and Noosa stretching out a little longer, I wondered whether I’d have time to focus on building up my running a bit in the June-July-August period, before I try to hit peak triathlon form in September. I goggled some more and found that in general, using running races as part of your triathlon training is not really recommended. Apparently it’s not smart to put pressure on yourself in one of the three sports, over the other two. But that’s OK – no pressure here. I need finish lines, but I don’t need to cross them quickly I don’t think. So I signed up for a half marathon in August. That’s 21.1km. Am I insane? This has already been established. Next question? 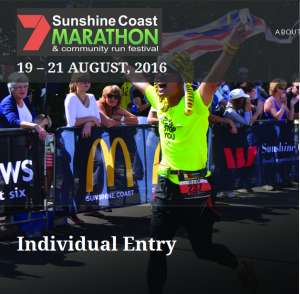 This entry was posted in Show Me Run and tagged beer, ego, failure, half marathon, newbie, noosa, pain, quitting, running, straddie salute, strategy, training, triathlon, Triathlon Gods. Bookmark the permalink. This is very funny and 100% accurate. Nobody likes the actually running. Not if you’re pushing yourself. Jogging can be nice. Not running. We do it for the AFTERWARDS! Those glorious moment in the shower when you tell yourself over and over how far you just ran and how amazing that is. Those moments driving in the car when you check how many k’s you are from home and think, ’32 k. I could run that if I needed to. If I broke down or something. I could actually run that. Like some kind of superhero.’ That’s why we run. Because we know we can. And you can. You do. You superhero. I think I was tricked by all the internet memes and whatnot that say ‘running is my therapy’ and other such things that made it sound like the actual running part was somehow nice. But what they mean is ‘that smug feeling you get after completing a run negates my need for therapy temporarily’. They need to learn to use their words. She is always right. But don’t tell her that.